+ Easily to create and manage options & the option group for any product. + Admin can customize price of these products according to options of product attributes and display them as horizontal or vertical. + Customize colors of price matrix table as Background Title Option, Text Title, and Text Select Item to suitable for your website. + Improve user-experience on your site. + Display the customizable options of products as the matrix table with the correlative prices that a shop owner created for each of them. Therefore, customers can select easily products with the corresponding price when hovering on each square. + Save huge time for online shopping. Step 2: Add the product to your cart. You click on the price in the table, fill quantity and then click on "add to cart" button. Step 3: The checkout step. You implement the checkout process as usual. Step 1: Install as the user guide. Step 2. Create the price matrix table for each product. Option 1: With the available products: In the admin panel, you go to Catalog -> find product you want to create the price matrix table -> click on "Edit" button in Action column to edit product -> click on "Create Price Matrix" part -> click on "Add Matrix Option" button and fill name of the product attribute, attribute value -> click on "Save" button -> click on "Create Matrix Table" button on "Create PriceMatrix" part and you fill in price here. Option 2: With new products: In the admin panel, you go to Catalog -> click on "Add New Product" button -> fill required product information -> click on "Create Price Matrix" part -> click on "Add Matrix Option” and fill name of the product attribute, attribute value -> click on "Save" -> click on "Create Matrix Table" button on "Create PriceMatrix" part and you fill in the price here. Step 3: Configure extension: In the admin panel, you click on PRICE MATRIX and setting something about this extension such as turn on/ off the module, Background Title Option, Color Text Title, Text Select Item Color, Quantity Title.... Remembering Save Config after each change. 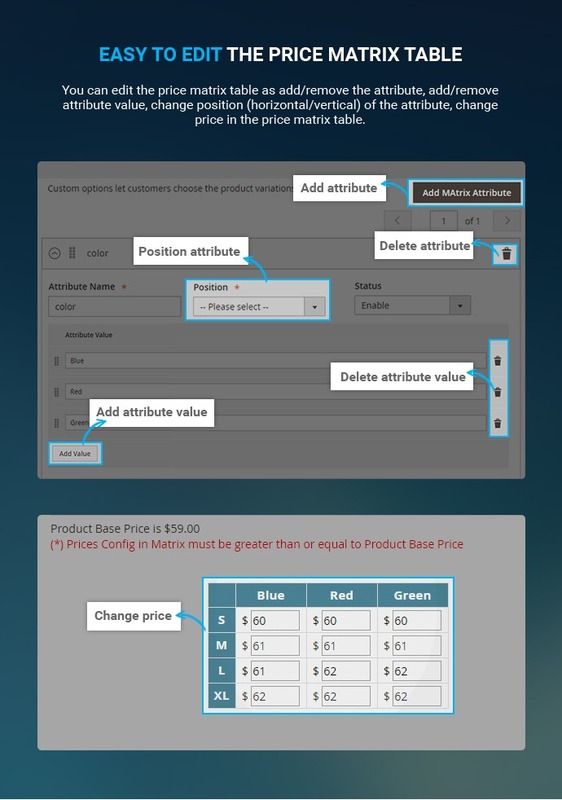 Create the price matrix table for each product: The price matrix table of each product will be created by combining options price of product attributes in the backend. Display the price matrix table on the product detail page: The price matrix table will be displayed on the product detail page. 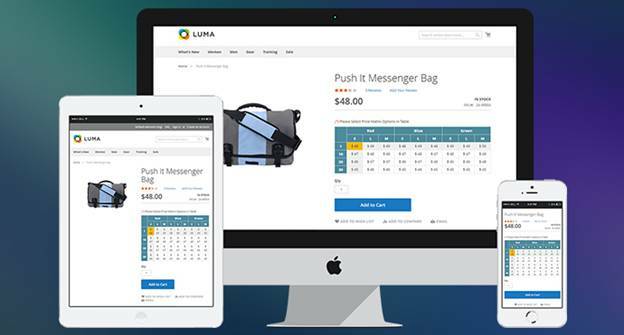 Your customer can view the price in the fastest way and makes the purchase decision quickly. 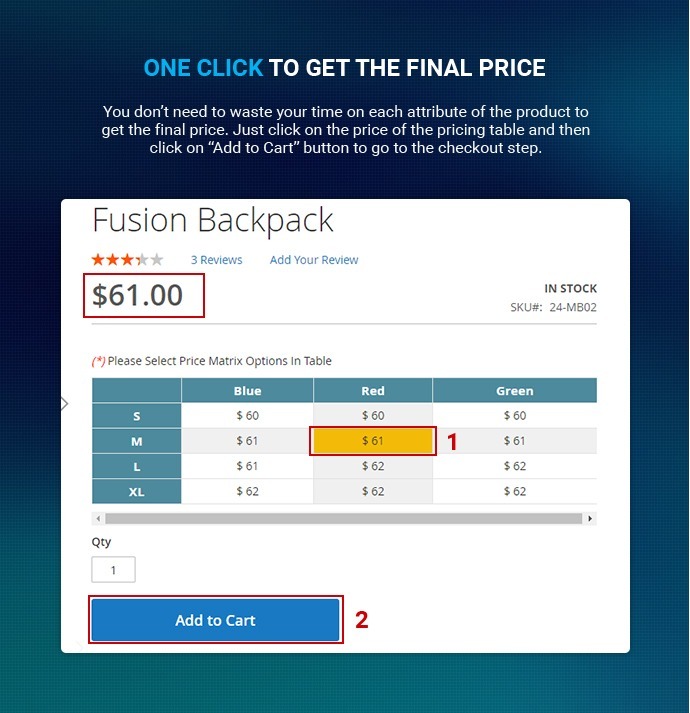 One click to get the final price: You don’t need to waste your time on each attribute of the product to get the final price. Just click on the price of the pricing table and then click on “Add to Cart” button to go to the checkout step. Display in vertical/horizontal position for created attributes: Admin can show attributes in the pricing table with the vertical or horizontal position. Unique calculation for "Quantity" attribute: With the "Quantity" attribute, we create the individual price rule, the price will be calculated corresponding quantity ranges. 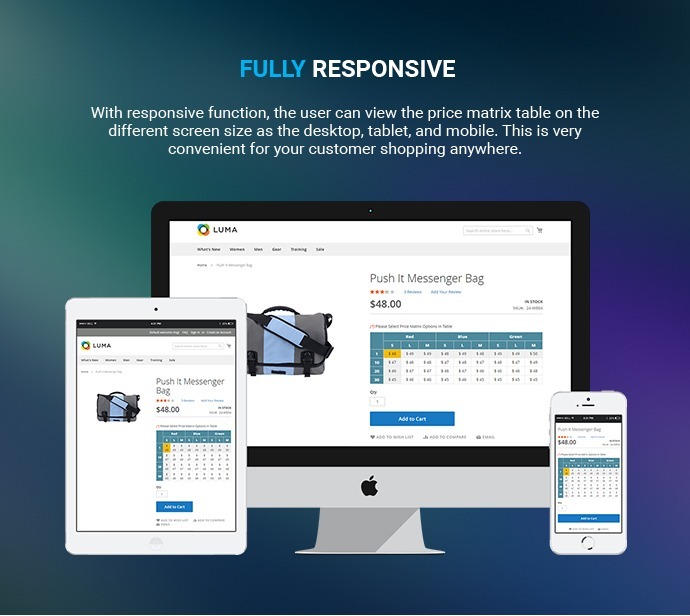 Fully Responsive: With responsive function, the user can view the price matrix table on the different screen size as the desktop, tablet, and mobile. This is very convenient for your customer shopping anywhere. 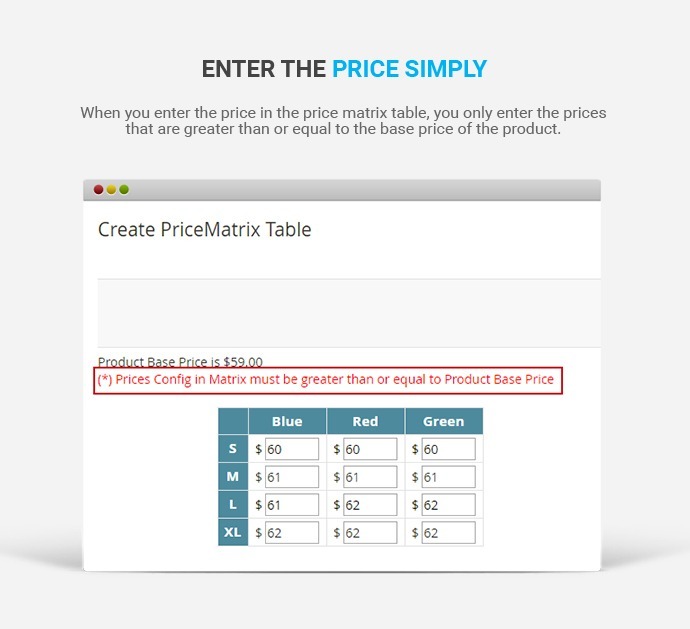 Enter the price simply: When you enter the price in the price matrix table, you only enter the prices that are greater than or equal to the base price of the product. Easy to edit the price matrix table: You can edit the price matrix table as add/remove the attribute, add/remove attribute value, change position (horizontal/vertical) of the attribute, change price in the price matrix table. Preview Price Matrix in the backend: After finishing configuration, the user can preview matrix table before showing it in the front end. 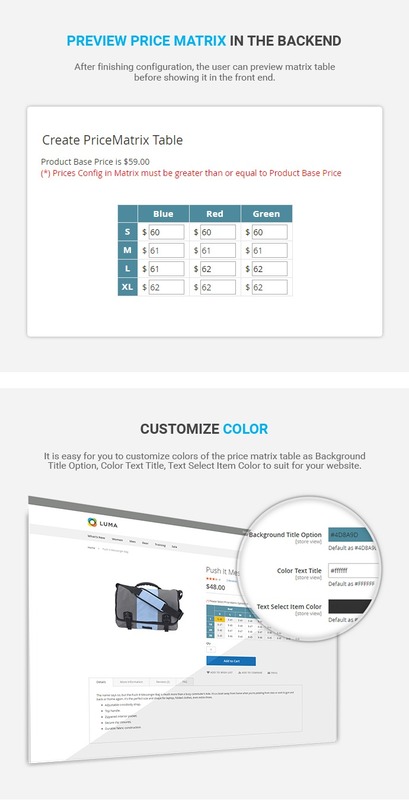 Customize Color: It is easy for you to customize colors of the price matrix table as Background Title Option, Color Text Title, and Text Select Item Color to suit for your website. 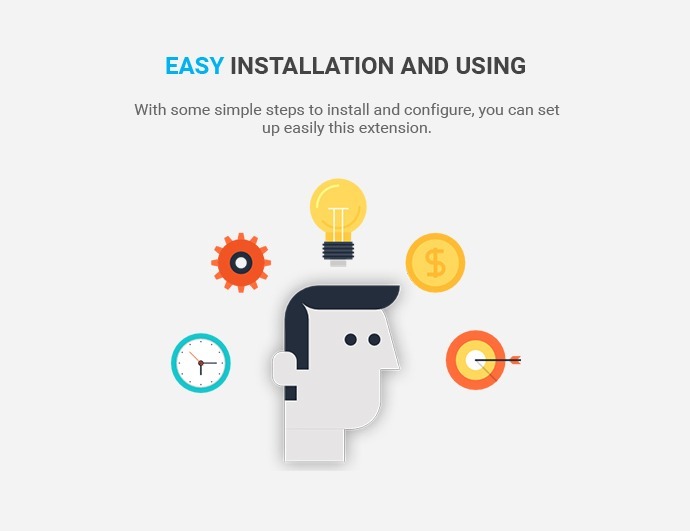 Easy installation & using: With some simple steps to install and configure, you can set up easily this extension. 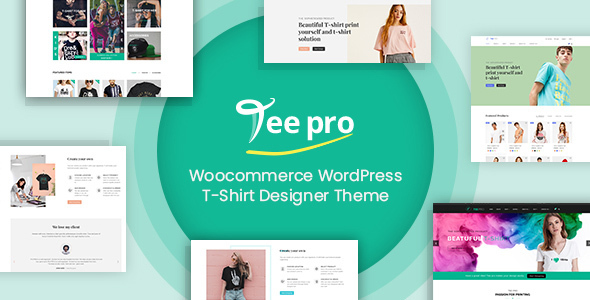 Compatible with any theme: It is easy to integrate this product with any Magento 2 themes and it makes your website more professional and attractive. I'm the wholesale in fashion field and you ext is indispensable for my site. The table of price is quite easy and clear to check. My customers are quite satisfied with the convenience your product could offer. Thank you!!! Wow, that's what my store needs. I had created tables for our products and my clients love its convenience. Give you five! Will the price matrix table display on the product detail page? Yes, it will display on the product detail page so that customer can view the price in the fastest way and make a purchase decision quickly. How many ways can admin show the attributes in the pricing table? Is this Price Matrix extension For Magento 2 responsive? Can admin edit the price matrix table? Can user preview matrix table before showing it in the front-end after finishing the configuration? Yes. User can preview before showing it in the front-end. Can I make a color customization for price matrix table? Yes, you can custom color for price matrix table such back ground title option, color-text title, and text select item color. Is this extension compatible with any theme of Magento 2? Can admin create the individual price rule? Yes, admin can. With the "Quantity" attribute, admin is able to create the individual price rule, the price will be calculated corresponding quantity ranges. Does this extension support many languages? Yes. All themes or extensions of Magento support all kinds of languages. You just need to install our language packages and then translate it into your wanted languages. Our Dev team will guide you how to make it. Is it possible for me to install our products on multiple domains? Yes. it is possible. It depends on the domain license support that you purchase. Yes, you should know that PayPal supports including all major types of Credit cards. Visit PayPal for more information. So you still can pay via PayPal with your credit card or E-check. We also support Credit Card payment via Onepay.vn and Skrill. Why haven't I received the downloadable link while i made a purchase already? 1- How can I manage the inventory of each option in the matrix? 2- Can I update the prices programmatically or directly in the database? I am Vincent from CS Department at Cmsmart.net. It is my pleasure to support you in this case. 2 => Yes, you can update the price directly in the database. Are you looking for a module that helps customers have the final price of each item when they do shopping on your site? Then, you can try the tool named Price Matrix. As you may know, Magento 2 has been improved and become as one of the leading platform on the Market now. 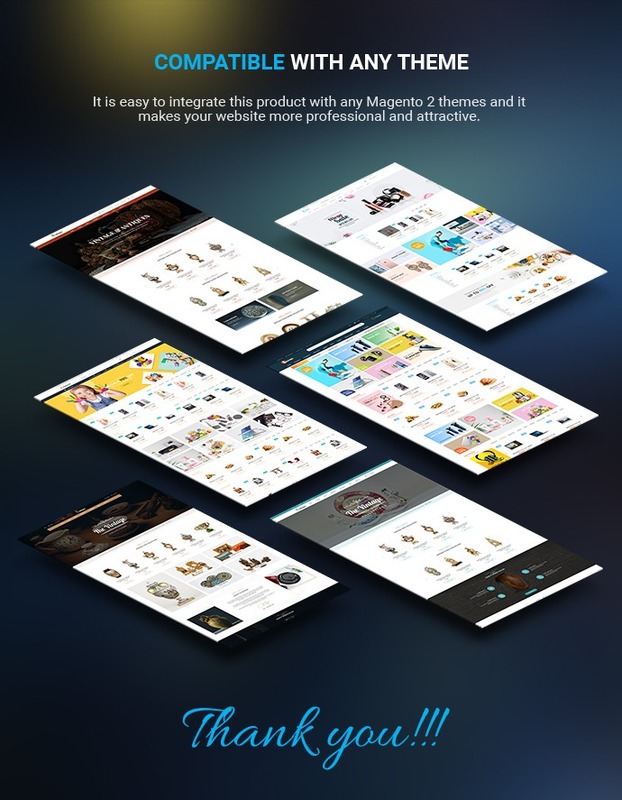 Magento 2 solution providers, as the result, always update and create extensions with new and useful functions, completing Magento 2 store in any fields from fashion, car, and furniture to printing industry. For both of these reasons, Magento 2 Price Matrix extension has been released with an awesome feature. This tool will add an additional power of saving more loyal customers as well as promoting user-experience of your e-business. 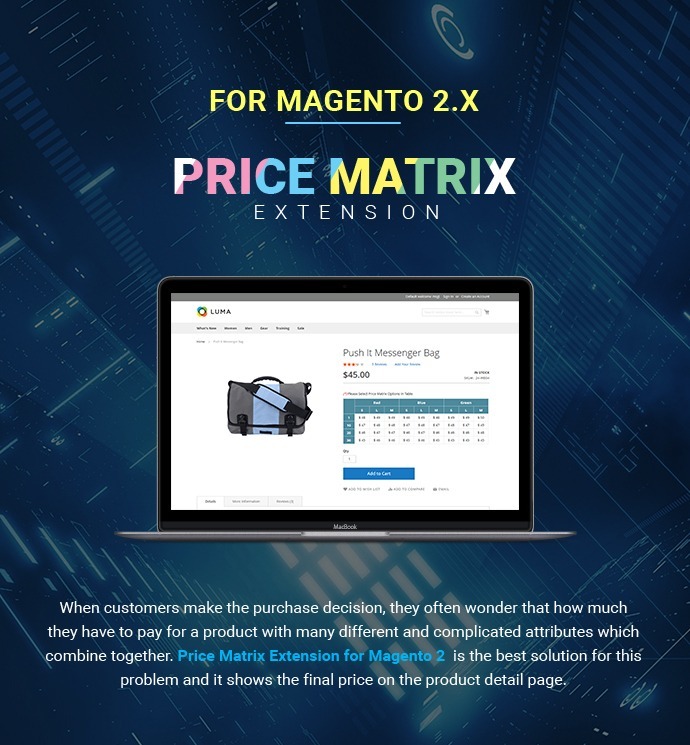 At first, Magento 2 Price Matrix extension is a calculation tool for customers when they want to know how much should be paid for a product with various and complicated attributes on your store. Just via a Price Matrix after a click, a table will show the final price right on the product detail page without time of waiting and page uploading. Have the final price corresponding with any selection of products when they go to the Product Page. 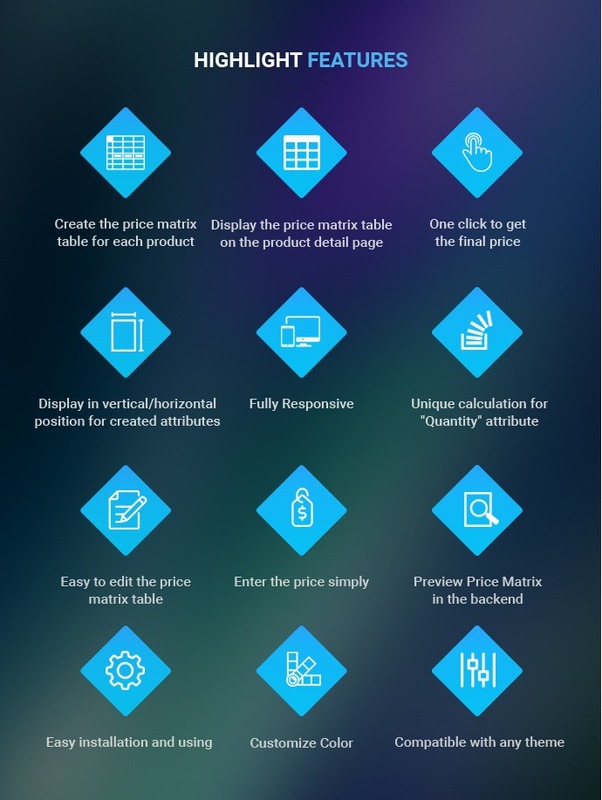 By displaying the customization options of items as the Matrix table and correlative prices, shop owners save much time for customers to do shopping online. Complete the Price calculation via just a click. 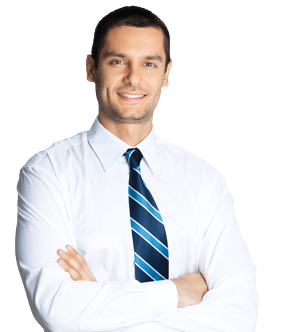 Moreover, they can access your Price Matrix on any devices like their smart phone, table or laptop because the module is totally responsive. Create and manage options or option group for any product, customize the product price according to each attributes. Also, you can display them as horizontal or vertical as you wish. Adjust attributes like color, quantity, size, and material of each product. Replace custom option tab of Magento Core by price matrix table. Customize colors of price matrix table as Background title option, text title and Text select item to suit for your web-store. Get easy installation and configuration. Improve your user-experience and increase traffic as well as loyal audiences. 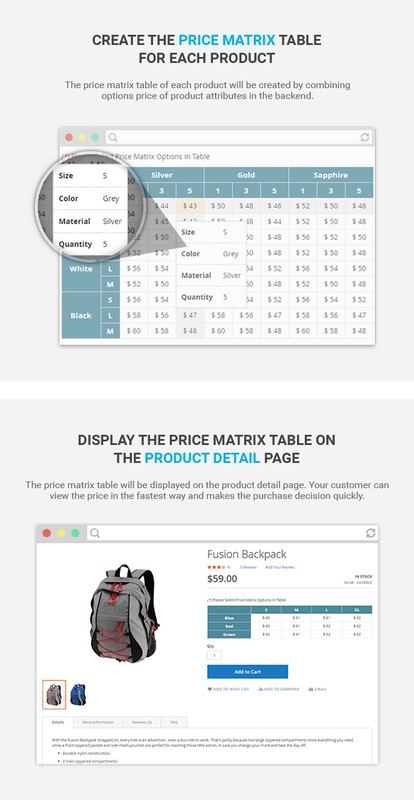 The Price Matrix table is displayed right on the Product page of every item, thus, customers are able to easily complete their online purchasing within some seconds. More importantly, users do not need to waste time on each attribute of the product to get the final number. The one thing they have to do is click on Add to Cart button and go to the Checkout page. With regard advanced features in backend of the module, Magento 2 price matrix extension totally supports your admin panel with simple steps. You can create the price matrix table for each product and let it displayed on each product page. And certainly, the price matrix table of each product is created by combining options price of product attributes in the back end. When it comes to Quanity attribute, the module allows you to create the individual price rule, and it can be calculated corresponding to quantity ranges. Right in the back-end, you can enter the price simply and the price must be greater than or equal to the base price of the product. 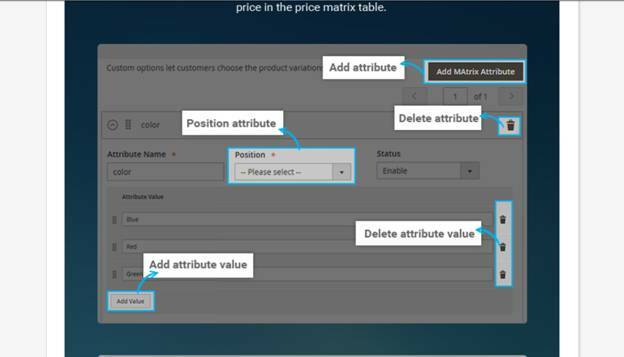 You do not have to worry about editing the matrix table because you are able to easily add/remove the attribute, add/remove attribute value, change position of the attribute or even change price in the price matrix table. Plus, any change in the back-end can be pre-shown and allow you to preview price matrix in back-end after configuration. Color customization is also important for your web-store? 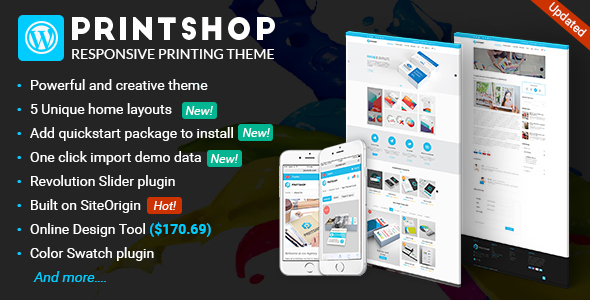 No worries, because it is easy for you to customize colors of the price matrix table as Background Title option, Color text Title and Text Select Item Color to meet your website’s requirements. As the introduction above, you just take 4 steps to complete installing and configuring the module for your site. 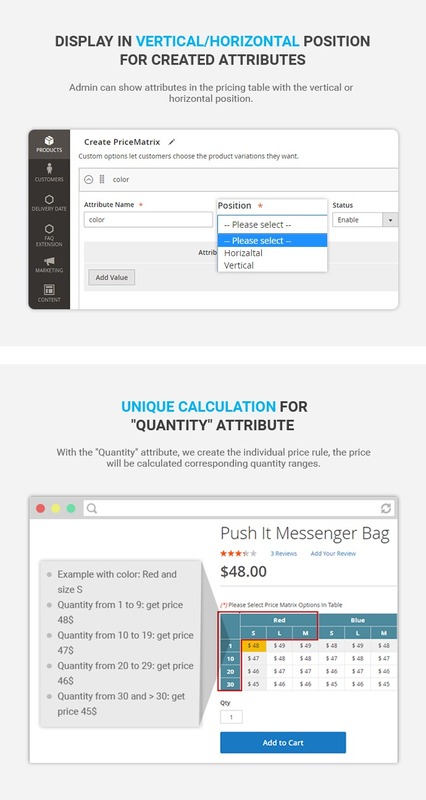 And the last but not less important, the Magento 2 Price Matrix extension is compatible with any theme of Magento 2, ensuring to make your web-store more professional and attractive. Nowhere can you find a better module than here. Just take a minute of discovering the demo first. You will be interested in the module and want to install it for your customers to enjoy.